Why do some Nigerians like to take advantage of their fellow countrymen? The saying that - one man must fail in order for another to succeed, is a proverb we must totally do away with. You must be wondering what’s causing me to vent, well it’s the fuel situation currently in Nigeria and the way the oil marketers and petrol station attendants have handled it. In my opinion, the operators of the oil sector in Nigeria have developed a system of robbing Nigeria and Nigerians in broad daylight. Some oil marketers have been falsifying figures and sometimes getting paid two or three times the amount for the same vessel of petroleum products being brought into the shores of the country, hopefully The General will help us get rid of those unscrupulous entities but they are not my reason for writing this brief, my qualms today is directed at the owners of petrol stations and their fuel attendants. Just last week, I spent over 7 hours trying to buy fuel due to the scarcity and mob rush at the stations where petrol was being sold. What hurt most was that the fuel attendant charged an extra 1,000 Naira to sell fuel into cars and I had to pay same, i mean, WHY SHOULD I HAVE TO BRIBE A FUEL ATTENDANT A THOUSAND NAIRA TO SELL FUEL INTO MY CAR, AREN’T I PAYING FOR THE FUEL ALREADY? WHO IS THE IGNORANT NIGERIAN THAT PASSED SUCH A LAW? IF SUCH LAW EXISTS, HOW ARE WE SUPPOSED TO BUY FUEL IN OUR GENERATORS, SINCE THE FEDERAL GOVERNMENT HAS NOT GIVEN US ADEQUATE POWER SUPPLY? 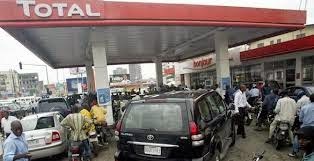 Now back to my experience, last Saturday morning, I arrived at the Total filling station, on Diya Street in Gbagada, Lagos at 5:00 am in the morning only to meet a mammoth crowd there already, the crowd was so much with okada riders, people with kegs and a long line of cars waiting to buy fuel. It was like a carnival and even the fuel attendants were afraid to begin to selling fuel and had to secure the presence of unarmed solders to manage the crowd, basically, everyone was struggling to get their kegs, vehicles and bikes in front of the pump at the same time. This caused so much chaos that my friend approached the manager to tell him how he felt the crowd could be better managed. He said “why don’t we allocate the pumps, some to sell fuel only to keg owners, some only to motorcycles and others for cars, this will lead to orderliness and free flow of persons in and out of the station”. The station manager replied thus “we can’t do that, some people will not make money. 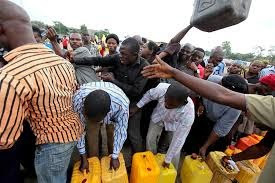 Here is how it works, each petrol attendant was charging 500 naira to sell fuel to anyone who carried a keg and 1000 naira to everyone that owned a car. So if you bought fuel worth 500 naira or 8000 naira, you still had to pay 500 naira. Also if you were buying 1000 naira fuel into your car or getting a tank fill-up, you still had to pay 1000 naira. I could see the greed and delight in the eyes of the petrol station attendants as they made an illegal stash of cash while they profited from the chaos by refusing to allow orderliness. WHY DO WE NIGERIANS ALLOW THIS DAILY? I would have suggested we begin to burn down the petrol stations of all those who charge this illegal fines for selling us their products but i am a gentleman, that’s why I am resulting to the pen. However, my question goes out to every Nigerian and policy maker out there, WILL WE CONTINUE TO ALLOW THIS HAPPEN IN OUR COUNTRY? Mr President, NNPC, somebody, anybody, pls do something about this.